• What motivates you to volunteer with CASA? • What is the biggest personal benefit you receive as a CASA volunteer? • What is the most memorable accomplishment of your volunteer experience? 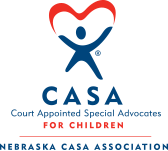 Nebraska CASA has a goal that every abused and neglected child in our state be given a voice in court by the year 2020. In order to achieve our goals, we are engaged in a series of initiatives to raise awareness of abused and neglected children. Our premier fundraising event is our annual Gala.